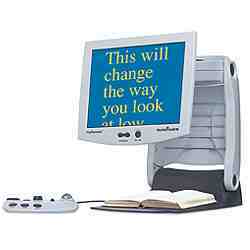 myReader is the world's first low vision auto-reader. Designed to benefit people suffering from eye conditions such a macular degeneration, diabetic retinopathy, cataracts and glaucoma myReader promises to revolutionise the low vision market forever. Unlike its predecessors, myReader scans and captures the entire page and then presents it to users just the way they want to read. myReader enables those with low vision to go beyond just reading bills and writing shopping lists, and to once again read their favourite books with ease. * Full page document capture: myReader's full page document capture makes automatic reading possible. With one touch of a button myReader captures an image of whatever is on the viewing table and rearranges it to fit on the screen according to your preferences. When reading with myReader you only have to scroll in one direction - no longer are you required to have to move back and forth trying to find the last line you were reading.